← Argyle International Airport in St. Vincent within a year? Not going to happen! Over the next two years, Barbadians should be better able to manage and dispose of various chemicals through a special project to be spearheaded by the Environmental Protection Department (EPD). The project will seek to raise awareness about the Globally Harmonised System of Classification (GHS) and Labelling of Chemicals. It will also help individuals and businesses to better manage chemicals from the point of manufacturing or importation to disposal. Speaking at the Lloyd Erskine Sandiford Centre yesterday at a workshop for the GHS project, Minister of the Environment Denis Kellman said the project would allow stakeholders to work together to chart a course that would see the GHS implemented here. 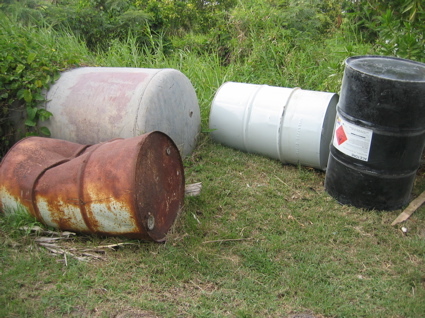 “The GHS promises to be an effective tool for strengthening the mechanisms of chemical management in Barbados by ensuring that the hazards of chemicals are classified in a consistent and predictable manner and effectively communicated to workers, consumers and emergency responders in a comprehensible and standardized format,” he said. Kellman said with greater awareness of hazards, he was expecting safer use of chemicals in the workplace and in the home. The environment minister said such behavioural changes would contribute to maintaining safe water supplies, an enjoyable and productive marine environment and protection of human health and the environment. Kellman recalled that in 2008 the EPD, with the assistance of the United Nations Institute for Training and Research (UNITAR), undertook a similar project and several “shortcomings” were identified which they would take actions to “overcome”. “Some of the areas earmarked for urgent action by stakeholders who participated in that project were safe handling, use, storage and transportation of pesticides and industrial chemicals, chemical safety in the workplace, waste management, education and/or awareness raising and training,” he said. Third world is right. What a deception! WHY WHY WHY WHY won’t our government pass environmental legislation and fine polluters????? ‘Environment Minister’ Elizabeth Thompson: Joke. No environmental protection law. ‘Environment Minister’ Byer-Suckoo: Joke. No environmental protection law. ‘Environment Minister’ Denis Lowe: Joke. No environmental protection law. ‘Environment Minister’ Denis Kellman: Joke. No environmental protection law. ‘Conservationist’ Peter Allerd: Joke. Keeping our natural heritage site at Greame Hall closed in an act of revenge and with a bad mind. Who wrote this article on BGIS MEDIA? Is this department a (loan) lending agency now? Prime Minister Freundel Stuart now has a better understanding of the operations of this island’s loan town planning approval agency, following a near three-hour tour of the Town & Country Development Planning Department last Friday. -rather than any real substance below said facade,veneer. I mean seriously now What’s the big surprise?? Barbados will always run this way….this way of bullshirtting its way thru life, as long as there are suckers enough to fall for it. but for now –and for the last 100 years– bullshirtting has worked for us. Politics and Publicity is about perception -not reality!